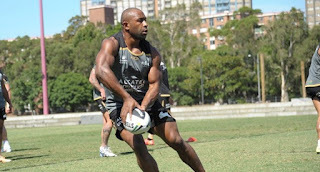 The Village Motors Dolphins have just announced the signing of former PNG Hunters Centre Thompson Teteh. Teteh was in dynamic form prior to suffering a season ending injury in against the Townsville Blackhawkes in August 2016. Now back to full fitness, Teteh will join Village Motors Dolphins Coach Adam Mogg’s squad for pre-season training from mid-November. “Thompson is an international quality centre who will add strike, speed and power to our backline,” Football General Manager Grant Cleal said. “As we have seen through crowd numbers at Intrust Super Cup games when the Hunters play here, there is a large number of PNG expats who live in suburban Brisbane. Their supporters can now see one of their own play for the Village Motors Dolphins, live every week rather than once or twice a season.” Cleal said. The 27 year old will base himself in Redcliffe and settle into employment with the support of the Dolphins. “We will ensure Thompson has the help he needs both on and off the field to make a smooth transition to the Dolphins,” he said.